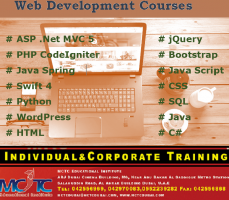 Web Development Training in Deira, Dubai!! With the popularity and advancements in web technology, it is mandatory for every business to have a highly functional and visually attractive website. Are you looking for a best solution to develop a website in Dubai? There are several strong platforms that is popular in web development according to the requirements. One of the most integral aspects of web development is web programming that is achieved with the help of programming languages. 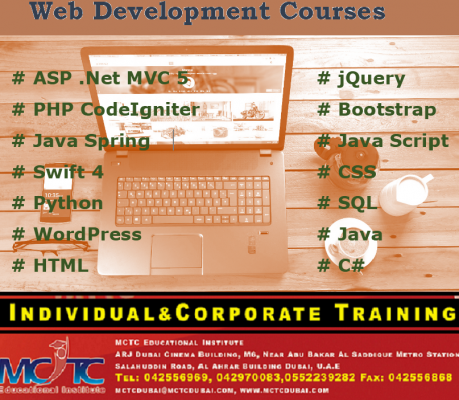 MCTC Dubai have proven years of experience in web development projects and training since 2006. We offer professional training and development for a variety of web development platforms with the help of well qualified and highly experienced professionals. #Java #Spring framework #ASP .Net MVC 5 #PHP CodeIgniter framework #Swift 4 # WordPress #HTML #CSS #Java script #PHP #SQL #jQuery #Bootstrap #Python and many more! We offer mobile apps in both Android and IOS too. Register with us to become a web developer to earn more in Duabi!!!!!!!!! !